To explain the difference, A Spherical Mirror is if you were to take a chunk out of a circle and make that your mirror shape (only in 3 dimensions, so you’d actually be taking a chunk out of a sphere, not just a circle.) A Parabolic mirror would be shaped as if you had snagged the bottom of a Parabola (that think ou learned about it Trigenometry or how your favorite stock graph looks like on the financial pages if you rounded out the curves). A Spherical mirror is much easier to grind than a parabolic as it has one very steady curve as opposed to a changing one, and there are fewer needs to check the curve of the mirror at multiple points. Now for a lot of telescopes, a Spherical Mirror will work just fine. If the tube is long enough (and thus has a long focal length) there aren’t many optical issues to be concerned about. 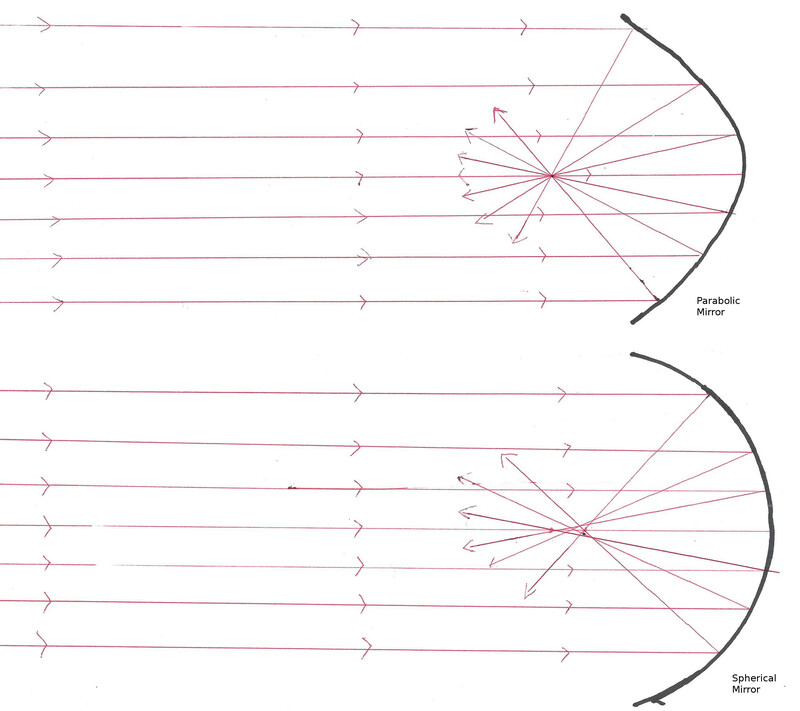 A lot of telescopes might have parabolic mirrors in their medium-to-high end reflectors even if they have longer focal lengths but this is more often for show than actual performance. But when focal lengths get short, the limitations of a Spherical Mirror become apparent. It has to do with the focal point of the mirror. You see, any uniformly curved surface will have a focal point. It is a point in front of the mirror where light coming straight on towards the mirror will pass through after it reflects off said curved surface. You might be familiar with the focal point if you have ever used a magnifying glass to focus light as a firestarter. As you can see, the Parabolic Mirror will keep the image just fine, but the unfocused nature of the short-focal-point Spherical Mirror will result in a blurriness that is known as Spherical Abberation. You may have already encountered Spherical Abberation – again if you ever tried ot focus the light of a magnifying glass you might have noticed it wasn’t quite as ‘perfect’ as some people would have you beleive. You might have noticed the focal point would slop around no matter how much you tried to align the lens. The same principle is in effect with the Spherical Mirror. So all those cheap no-name reflecting telescopes? They had short tubes (which saved on tube materials) Spherical Mirrors (which were cheaper to manufacture) and only adequate mounts. They cashed in on a market of the ‘slightly informed’ customer who may have heard that a large aperture was important without realizing there were other issues. 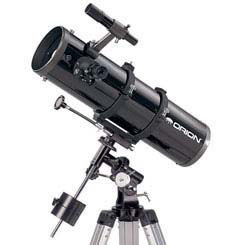 Some telescope manufacturers try to compensate for the Spherical Abberation by adding a negative barlow lens into the focal tube of the telescope. This does have some effect in alleviating the problem, but does tend to be the optical equivelant of trying to get the toothpaste back in the tube. Sure, you might recover some of the toothpaste but it would have been better had you not squeezed out so much in the first place.